Which strategy will maximize the future success of our organization? Which new hire will be the most successful with our team? What should I work on today to ensure our goals are met? What should I eat for lunch to maximize my enjoyment or health? Every decision we make, no matter how trivial, is intended to accomplish some goal in the future. We must decide what our best course of action is today to ensure that we are successful down the road. What challenges will we face? What will the environmental conditions be? What should we be doing now to set ourselves up for success later? Our ability to make the right decision in the moment is dependent on our ability to forecast the future accurately. If we knew exactly what was going to happen, making decisions would be much easier. Unfortunately, that future is uncertain. We can’t know for sure how things will turn out. We don’t have all of the relevant information. The best we can do is guess. If our goal is to predict exactly what will happen in the future, it can feel like a lost cause. There are too many variables and possibilities. We can’t see far enough down the road. The Magic 8-Ball lies. Instead, we should shift our focus to determining a likely future. What are all of the possible outcomes and how likely are they to occur? He describes the work of a program called the Good Judgement Project, which trained people to improve the accuracy of their forecasts by thinking about what could happen instead of what will happen. They were taught to use all of the information at their disposal to estimate the probability of each possible outcome. By challenging their assumptions, and constantly incorporating new data regarding possible outcomes, the students were able to dramatically improve the accuracy of their predictions. So how can we improve our ability to think probabilistically? While I would love for advanced training in statistics to be a requirement for everyone, it is not very practical. Luckily for those of you that just broke out in a cold sweat, it isn’t necessary either. Whether you realize it or not, our brains naturally process information statistically. We just need to nurture it a little bit. According to a recent study, it is possible that human intuition, that gut feeling that we get when making decisions, is actually the result of our minds subconsciously performing statistical calculations. Our minds already think probabilistically, without us even realizing it. If we work on improving our natural intuition, our probabilistic thinking will improve. One way that we can practice probabilistic thinking is by playing games that require us to make decisions based on an uncertain future. Nearly any card game, especially poker, encourages this type of thinking. Here are a few skills that playing poker can help you develop to improve your forecasting and decision-making. –Think in terms of likely outcomes. Poker requires you to make decisions without full knowledge of the future. You don’t know what cards will be dealt next or what cards your opponent is holding. You do, however, know what cards are available and what the possible outcomes are. The practice of thinking through those outcomes and their relative probabilities trains your brain to think in those terms any time you make a decision. –Clarify long-term goals. When playing poker, the goal is not to win every hand. Losing hands can actually be a very valuable step towards winning the overall game. Each hand is an opportunity to learn more about your opponents, or to identify or establish a pattern that can be exploited later in the game. If you do not train yourself to focus on these opportunities, you will have a more difficult time winning the game in the end. This is true for all of our decisions. They should be made with our ultimate goals in mind, so that we don’t miss out on opportunities to improve our odds of long-term success. –Constantly challenge assumptions and adjust thinking. Throughout the course of a poker game, good players are constantly taking in information and using it to challenge their assumptions. The goal is to learn everything you can about your opponents: betting and playing styles, body language, their estimation of you. Anything that can help you figure out what they are thinking and what they will do. Learning to adjust your thinking as you observe and learn more about them will improve the accuracy of your predictions and help you to be more successful. We should treat all of our assumptions this way. We should always be on the lookout for new information that will help us correct errors in our thinking or assumptions that would otherwise cause us to make poor decisions. –Seek out broad experiences. 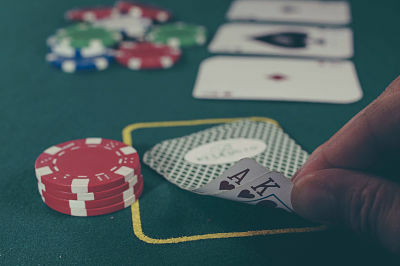 One of the best ways to improve at poker is to play… a lot. The more situations that you experience, the more lessons you can learn. Observe how others play the game. Learn what has made professionals successful. Also pay attention to what contributes to their failures so that you can avoid those mistakes. Learning to do this during a poker game will help you learn how to seek broad opportunities elsewhere in life. Learn from others’ successes and failures. Seek out people with viewpoints and experiences that are very different from your own. Every new situation is an opportunity to learn and improve your own decision-making. While it would be nice to make all of our decisions based on perfect information about the future, this will never be the case. Instead of lamenting this fact or putting decisions off out of fear, we should embrace the fact that uncertainty is a part of life. Have fun, play some games, and know that your ability to make decisions in this environment is improving.